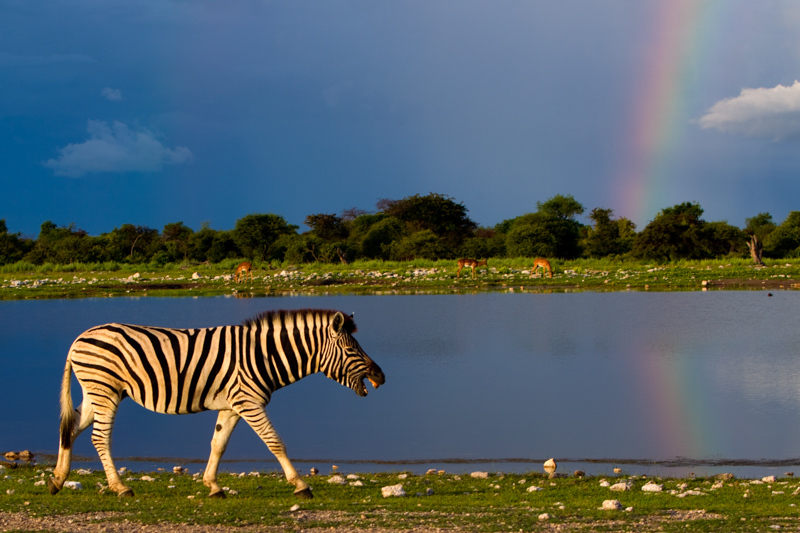 A zebra walks in front of a rainbow near the Klein Namutoni waterhole. Rainbows have the power to make any place look magical, especially if they make an appearance in places that are already very charming. Klein Namutoni is a beautiful waterhole in eastern Etosha that seems to be always teeming with animals from ungulates to birds, and an occasional lion or two. On that afternoon, however, there was a storm nearby and animals generally tend to stay away from waterholes when there is water to be had elsewhere. A handful of black-face impala and zebra remained along with a small group of vultures and ducks. I tend to photograph, or at least document, any tagged or collared animals because researchers may have use for it, and I saw that some of the vultures sported wing tags. As I was engrossed in vulture documentation, I had failed to notice a rainbow that had popped in front of the stormy sky. You should photograph that rainbow, Wendy suggested. What rainbow? There was a fantastic background and the sun was behind me at a great angle. Nature’s studio was all set, but there were no eager takers for the role of a model. After what seemed like eternity, a zebra on the near side decided to walk into the frame. And as I clicked away the zebra called out kwa-ha-ha-kwa-ha-kwa-ha (the source of its scientific name – Equus quagga) which added a nice touch to the photograph. Just as the calling zebra moved out of the frame, I noticed that another zebra on the far side had now walked right into the frame, and even better: it stood directly below the rainbow. I don’t know if the photograph evokes the same feeling in everyone who sees it, but for me it was a sheer magical moment looking at that zebra standing at the end of a rainbow. A pot of gold! 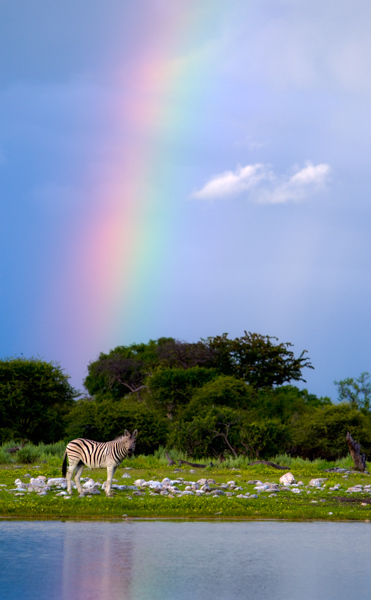 A zebra at the end of a rainbow.